You're here » Song Lyrics Index » D » Dakoda Motor Co.
Ladies and gentlemen, start your engines and get ready for the ride of your life. If you like energetic guitars, insightful lyrics, infectious melodies and absolutely fabulous vocals, you are going to love the new release from Dakoda Motor Company. The title says it all - Welcome Race Fans. It's sporty, stylish musical fun, an invitation to a celebration of life in Christ at its most joyful. Behind the wheels of this musical adventure lie the talents of lead vocalist Davia Vallesillo, guitarist Peter King, bassist Derik Toy, drummer Chuck Cummings and the band's newest member, guitarist Elliot Chenault. Following their highly acclaimed debut, Into the Son, Dakoda has released another collection of lively tunes that defy categorization. Some call it pop. Others label it alternative. To many it's surfer rock, but whatever you call it - it's fun music with an important message. The nucleus of the band came together when Davia and Peter met at the beach in LaJolla, California. Pretty soon they were leading worship services and began looking for other creative individuals interested in combining music and ministry in a cutting edge band. They found kindred spirits in Chuck and Derik, both accomplished musicians on the local scene. The band soon developed an enthusiastic following as they garnered rave reviews opening for mainstream bands like Mary's Danish and dada. Dakoda Motor Company's musical ministry gained a national platform with the release of their Myrrh debut, Into the Son. The disc spawned five top ten records, including the number one hit "Wind an' Sea." 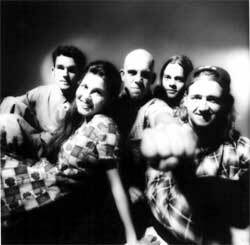 They were lauded in Billboard Magazine among the hot mainstream acts on the 1993 Critic's Choice List when writer Jim Bessman proclaimed "the sunny charm of this southern California alternative Christian band can't be denied." How are they going to top a year like that? With Welcome Race Fans. "I think this album has a lot more energy," Davia says. "I think it gives more of a feel about what we're like when people see us live." Chuck agrees. "I can't describe what it is, but there is definitely a lot more energy and a lot more diversity in the songs," he relates. The songs for new album were born in a high-energy collaborative situation as band members convened in the studio. "The first record was a little different in the sense that Peter wrote the majority of the music with the exception of maybe the drum and bass parts," Chuck recalls. "On the second record, Peter would come in with a basic chord structure and the band would, over a period of a few days, slowly kind of put it together, arrange it, change some chords, that kind of stuff . . . and as soon as the song started to take shape, Peter and Davia would collaborate on the lyrics." The result is an engaging collection of tunes ranging from the warm, melodic "Friend In My Eyes" to the innovative "Uglier" to the driving "Trip To Pain." The latter tune is one both Chuck and Davia describe as one of their favorites. "It's about how we can have a trial, a really painful time, but that God can save us over and over again," Davia relates. "It's about God's grace and his mercy. Even though we put ourselves in hard situations, he still loves us and he'll back us up again and again." "Stand Up" is one of the most powerful cuts on the project. "It's bold in the sense that it's a direct statement to Satan," Chuck says. "The lyric say 'go back to where you come from, I command you in Jesus' name.' It's powerful. It's saying 'look, you have no business being here.' It's a straightforward song." "Friend In My Eyes" is a song Davia says describes her idea of a good relationship. "It's a dream of mine," she confesses, "for a Christian relationship. The lyrics say 'we'll run through the snow and we'll share all you know about angels and visions and prophets of old.' I just think it's a dream Christian man and woman relationship." Exploring all facets of life as Christians in the '90s is what Dakoda Motor Company's music is all about, but most of all it's music about the joy found in a life in Christ. "One thing that's really good about most of our songs is you don't really find much cynicism in them," Chuck relates. "It's all very up, happy kind of stuff. There's a lot of real personal stuff intertwined in our music . . . It's like this is what happened in my life. When it becomes more personal I think more people are apt to listen to it with an open mind." One of the most gratifying aspects of Dakoda's growing popularity is their enthusiastic acceptance from mainstream audiences. "Everytime we play to a secular audience we have an overwhelming response," Chuck says. "Our music is so straightforward and our lyrics are so simple that everybody gets what we're talking about right away, but it's not threatening to them." Davia agrees. "We do it with confidence too," she adds. "We're not like going, 'sorry we're singing about God.' It's like 'hey, we're singing about God.' The words just come out and people respect that." Welcome Race Fans is sure to rev up the enthusiasm of those who are already Dakoda fans as well as ignite the interest of those who've yet to experience the ride. It's an exhilarating musical experience sure to place this happy California band squarely in the winner's circle. "The name Dakoda Motor Company is just like energy, like an engine moving," Davia says. "That's just that way we are on stage and I think that's the feel of the whole album too. So welcome race fans. It's like we're welcoming all of our fans to join us, have a good time, have fun. That's what it means to me."